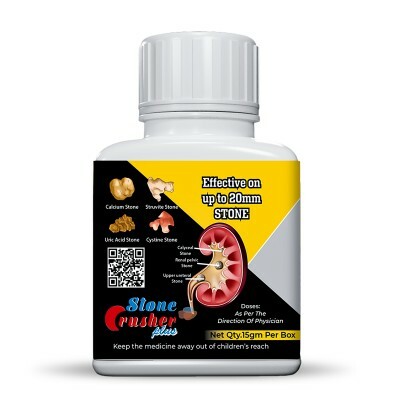 The treatment is kidney stone has become very easy with the help of Pharma Science the India Ayurveda’s Stone Crusher. This stone crusher will remove all your kidney stone up to 20 mm. it comes with the 100% money back guarantee. There is 4 doses in a box of Stone Crushers, it have to be eaten for 4 days regularly, for which every doses has to eat on 3 adult (large size) leaves of Bryophyllum pinnatum (Pattharchatta) in morning on empty stomach. After takeing this medicien do not eat any type of food for 1 to 2 hours; can take water or juice only in this duration. "Pashanbhed - 3 Gm Varuna - 2 Gm Hajrul yahood bhasam - 500 mg Gokrush - 2 Gm "